It hit me like a ton of bricks. Bricks made out of screaming teenage girls. Twerking. Tens of thousands of them. All in synchronicity as their fearless leader Miley Cyrus belted out her famous tunes on the Y100 Jingle Ball stage in Miami last December. The bricks didn't just hit me and fall down, however. On a daily basis, they like to get back up, circle me as if performing a taunting tribal dance, and proceed to smack me in the face repeatedly, like when the family dinner-table discussion a few nights back switched from one about work, current events, and checking in on each another's emotions to a debate over the status of Jay-Z and Beyonce's (apparently deteriorating) marriage. As a society, are we paying attention to the things in life that really, truly matter? If we can step outside the world of Orlando Bloom throwing punches at Justin Bieber and, for a brief moment, pay attention to things that really change lives, I'd love to share the quick stories about just two of my amazing friends. Just two, quick stories. That will change the way you view life forever. Stick with me here. In 2003, at 9 years old, Kristen Powers found out her mom was going to die from Huntington's Disease. Although the disease is rare (a little over 300,000 people in the U.S. are affected by it), it causes chronic mental deterioration that leaves affected families devastated as they watch their loved ones wither slowly, over years, without any ability to help. Worse, it left Kristen with a 50 percent chance of inheriting the same disease that ultimately claimed her mom's life when Kristen was just 17 years old. Less than a year later, at 18, she decided she'd share the experiences of her and her family and create a documentary about getting tested for the disease herself (18 is the legal testing age to see if she would have the same fate as her mom in the future). In an act of bravery and in an attempt to spark national debate about genetic testing and the search for cures to various genetic diseases, Kristen decided to make a documentary called Twitch about getting tested for Huntington's Disease. She managed to crowdfund over $45,000 to create the documentary, grace the stage at TEDxTeen, and is now embarking on a national screening tour to share her documentary and get people's attention, if only for a moment, to shed some light on Huntington's Disease. Not only that, but she's trying to make our generation the last generation that suffers from this terrible disease. She's put in years of hard work to make the documentary a reality, and will probably spend the remainder of her lifetime (whether she found out that she has the disease herself or not) fighting to find a cure. Are you paying attention? Do you think this matters more than who Harry Styles is dating right now? I (humbly) think so. Another friend of mine, Leora Friedman, connects pediatric patients with recording artists who meet with the sick child, record a special song just for them, and debut it to them and the rest of the world in order to raise money for various hospitals. So, instead of making songs about twerking, they create music that makes a difference and generates funds for the causes that paired these singers with their pediatric patient counterparts in the first place. Leora started Music Is Medicine, the non-profit organization behind this work, by recording songs with her sister for hospitalized kids in Baltimore. After a few years of doing the singing themselves, they recruited Emmy-nominated singer/songwriter Drew Seeley to create an original song for one special patient, Brooke, who (at the time) was a thirteen year old cancer patient. After speaking with Brooke via Skype, Drew wrote and recorded "Fly," a (really) touching song that has garnered over 190,000 views and became Brooke's theme song and opportunity to inspire others before she unfortunately sucumbed to her battle with cancer. 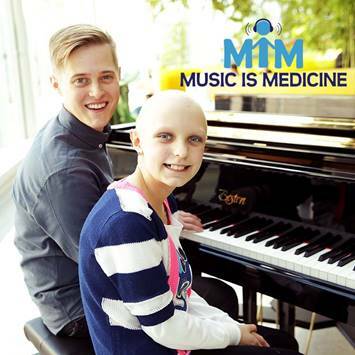 Now, on August 5, Leora, the rest of the Music is Medicine team, and High School Musical and ABC Family's Switched At Birth star Lucas Grabeel are releasing a new original song called "Beautiful Day" for Samantha, a 10-year-old girl currently battling cancer at the Ann & Robert H. Lurie Children's Hospital of Chicago. These are things that really important. The work that Kristen and Leora do on a daily basis may go relatively unnoticed, but these are the type of things that are changing lives. It's what really matters. So, reader, if I can leave you with a challenge, it would be to stop. And think. Think "Am I paying attention to things that really matter?" Doesn't have to be always. But, every once in a while, are you stopping to smell the proverbial roses and do, support, or create things that really matter? If you are doing something that really matters, or want to share something that perhaps one of your friends is doing that is having an impact on others, please comment below so we can all continue to support and be inspired by people like Kristen and Leora.